Chef Siegler was born in the Angers region of Western France. 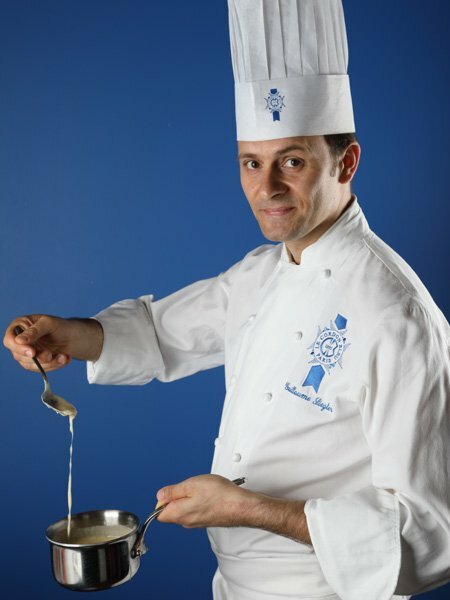 Having successfully completed his “Certificat d’Aptitude Professionnel (CAP)” and his “Brevet d’Étude Professionnel (BEP)”, Guillaume Siegler began his career as an apprentice at the 1 Michelin-starred Le Pavillon Le Queré restaurant before moving on to another Michelin-starred restaurant, Les Jardins de la Forge. In order to perfect his culinary techniques and expand his culinary horizons, Chef Siegler left his birthplace and headed to Paris. He was taken on as a “commis” at Le Violon d’Ingres restaurant under Chef Christian Constant. In 2000, he began working as a “commis” at the two Michelin-starred Le Carré des Feuillants restaurant. In 2002, he was named cuisine Chef at Le Petit Rétro restaurant, where he remained for around two years. 2004 proved to be a turning point in Chef Siegler’s career when he began working as Chef at Le Pré Verre restaurant. He developed his cuisine talent and global vision, became a partner Chef, and opened a second Le Pré Verre restaurant in Tokyo. In 2009, Chef Guillaume Siegler decided to make Japan his home, leaving the profession of Chef for the field of education. His passion for passing on expertise and sharing enabled him to land a job at Le Cordon Bleu Tokyo institute. Chef Guillaume Siegler remained there for 5 years during which time he evolved from Technical Director to Executive Chef. In order to boost and develop his career, Chef Siegler has taken part in many culinary competitions. Amongst others, he was awarded 1st prize in the 2014 national Charcuterie competition in Japan and 1st prize in the 2016 international “Note à Note” cuisine competition. Chef Siegler decided to return to France and joined Le Cordon Bleu Paris institute team of Chef Instructors in 2017.